Nestled in the heart of Harlem, this magnificent townhouse is perfect for groups, families or even a simple romantic weekend getaway. Comfortably accommodates up to 9 persons with additional bedding, complete with full kitchen, generous dining and living areas, this charming spacious brownstone is the ideal setting for your next trip to New York City! Situated near all major subway/bus lines, you can be in Central Park or on Museum Mile in moments, and in Mid-town through Downtown in no time at all! Rooms: The Master bedroom has a Queen size bed, an Antique twin bed and small sofa. The 2nd bedroom also has a Queen size bed. The Mezzanine is a loft-style bedroom which has 2 wooden Full beds and access to the Terrace which gets beautiful light through the generous skylight over the open area kitchen, dining and living spaces. Park: *There is a playground which closes at dusk right next to the townhouse. We had a fabulous time and enjoyed the property very much. It was nice to be able to have the adults on the 1st floor in the 2 spacious bedrooms and the kids up in the 3rd floor loft. Lots of blankets and towels. Also plenty of room to spread out on the main floor in the living room / fully stocked kitchen / and large dining area. Stayed here over Christmas - perfect space for a family get-together. We had an issue with the wi-fi that the owner sorted out. Lovely, comfortable beds and good heating. Recommend M1 bus for getting downtown which is much closer than the subway stations. Loved the house. Perfect location in a nice neighborhood. Very eclectic decor which everyone loved. 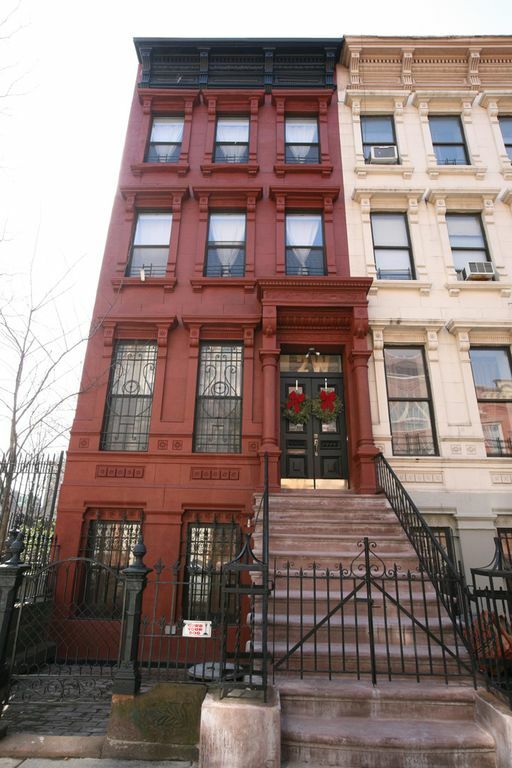 This very large brownstone comfortably sleeps nine, has a total of 5 beds, and 2 bathrooms. Our group of high school girlfriends only had 5 people so we each had our own bed to sleep in. I was the lucky one who got my own room. The bedrooms are on the second and fourth floors, the HUGE living room/kitchen/dining room open space is on the floor between them. I can't say enough about how large all of the space are. The property is a 10-15 minute walk from the 125th street subway and is about a 20 minute ride to midtown. The neighbors were friendly and pretty much everything you need is in the neighborhood, smaller grocery stores, liquor stores, pharmacy. If you have 3 people in your group the cost of this will be hard to beat when comparing the pricing to any hotel. Realistically you are getting about 10x the space for the nearly the same price. Great for groups of 5 to 9. The only downside I could possibly see is if someone in your group has mobility issues there are a lot of stairs from the street to the door is steep, and then to get from the front door to the first bedroom level is another staircase, and to get to the kitchen and living room would be another. But we all got in a lot of walking and more stair cases than we normally do in a weekend. I thoroughly enjoyed myself along with my friends and family. It's a great location and close to subways, restaurants and grocery stores. The only reason I did not give it 5 stars was due to the shower being cold on a few occasions, otherwise it's a great place for family and friends. The host was accommodating to us since we had a late flight. The photos are very accurate and the place is very clean. Thank you and we will return again. Beautiful place with easy access to subway. We had a wonderful stay at this beautiful brownstone. Subway just a short walk away. Great restaurants nearby. Aways felt safe walking around this area. Only 2 things need some work, need more towels available and the showers were pretty chilly. Maya was a wonderful host, she was quick to respond if we needed anything or had questions. I would definitely stay here again.